September 2018: The return of the Northern Lights in September also marks the beginning of the main booking season for winter travellers to the Nordic countries and Canada. While the magic of the celestial lights remains consistent, there are many new and exciting developments happening on the ground. Travellers can look forward to new ways of seeing the Aurora Borealis, experiencing Nordic culture and become part of a more sustainable future in Arctic tourism. Examples include the world-first e-snowmobiling provider, the rise of glass accommodation in the Yukon, the launch of the sauna bus in Finnish Lapland and the latest designs of Sweden’s iconic ICEHOTEL. Usually, the advent of Lapland’s winter season is marked by the roaring sound of snowmobiles pacing through the snow-covered forests. This winter a more subtle, buzzing tune hails the start of a more sustainable peak season. 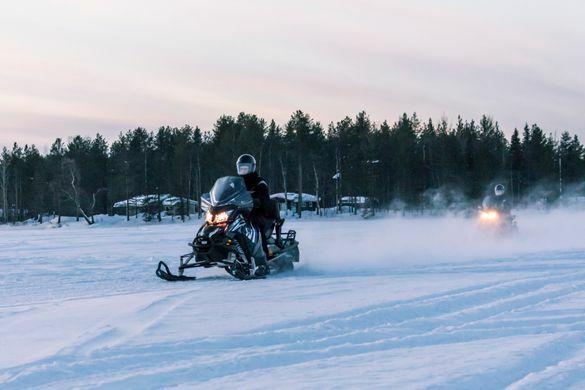 The sound belongs to the world’s first, zero-emission e-snowmobile exploring the wintry surroundings of Rovaniemi in Finnish Lapland. On the almost silent snowmobile, travellers can experience the magic of Arctic nature in a much more immersive way. The e-snowmobile is part of a larger trend towards more sustainable initiatives in the Arctic including e-cars, e-planes, e-cruise ships some of which are set to launch in 2019. Arctic stargazing from the comfort of a queen-size bed is possibly the most hygge way to seek the Northern Lights. Snuggled up in floor-to-ceiling glass chalets, guests can enjoy amazing skyviews at the Northern Lights Resort and Spa, the Yukon’s first luxury glass chalet. Only a short drive away from wilderness capital Whitehorse, the boutique resort beckons with an outdoor hot tub, local gourmet food and two saunas. The chalet comes with a small kitchenette, a fireplace, floor heating and an ensuite bathroom. Guests can stay in the chalet from 1.12.2018 for a minimum of three nights. Finland’s famous sauna routine is now available on the go! The sauna bus which departs from Rukka in Finnish Lapland turns the commute to a variety of regional saunas into a relaxing spa experience-a little warm up so to speak. In the back of the bus groups of 6-17 people can join Finland’s most popular spa ritual in a small wooden sauna. The bus first halts at the ice sauna-a gentle, steaming sauna, built from ice blocks. A roll or two atop of the frozen lake nearby complete the sauna stopover. The bus then heads towards a traditional smoke sauna, where travellers can opt for some downtime in the outdoor hot tub. After 4-5 hours the bus returns to its original destination located close to the popular Rukatunturi skiing resort. A perfect introduction to the Finnish way of life when travelling with a group of friends or your family. The ICEHOTEL in North Sweden has released the artists’ sketches for its 29th winter season. This year the hotel welcomes three UK artists to design two out of the 19 suites. Jonathan Paul Green and his daughter Marnie Green will design “The Living Ocean Suite”. “Flock” will be designed by Lisa Lindqvist & Ulrika Tallving a team from UK & Sweden. Oceans have emerged as a theme amongst the global community of ice artists and the ‘The Living Ocean Suite’ aims to raise awareness of the challenges that overfishing and climate change present to life in the ocean. Launching 1.12.18 Exploring the backcountry of the frozen North on four wheels is no longer an adventure reserved to Iceland only. Explore the snow-covered surroundings of Norway’s Arctic capital in the driver’s seat of a 4×4 Arctic Truck. The vehicle designed to negotiate deep snow and Arctic off-road conditions requires no specific experience just a sense of adventure. Drivers will tackle challenging mountain terrain, icy plains, and remote mountain roads, spending most time off-road. After nearly five hours of driving, a wilderness dinner is served in a traditional lavvo tent. For an added layer of excitement, drivers can opt to hit the slopes at night and perhaps catch a glimpse of the Northern Lights.